When the Superfast science party ages the rocks in the cores from this expedition, they will do so with zircons. 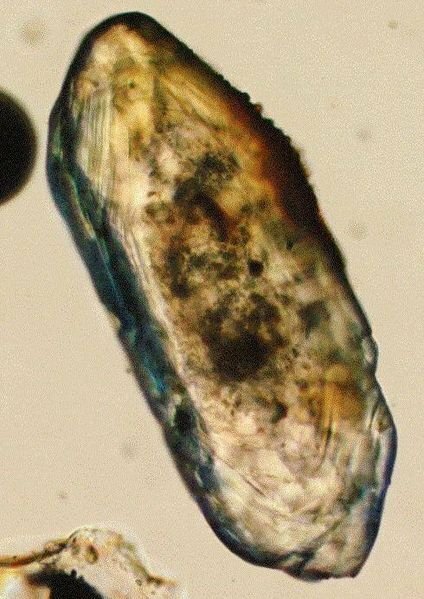 Zircon sounds like the name of an evil Martian tyrant in a 1950’s science fiction movie, but it is actually a mineral that can form within an igneous rock when magma first cools into rock. Zircons are the clocks inside of ocean rocks. Zircons are clocks because they contain uranium. If you remember my last blog, you know that the radioactive isotopes of uranium continuously turn into lead over long periods of time (i.e. billions of years). When magma cools into rock, zircon crystals form inside the rock with uranium isotopes trapped inside of the zircons. Once locked inside the zircon, the uranium does not stop decaying. It continues changing into lead. The new lead also cannot escape from the zircon. It stays in there with the slowly disappearing uranium. As time goes by, the amount of lead in the zircons will continue to increase and the amount of uranium will continue to decrease. When a scientist wants to age a rock, she can measure how much lead and how much uranium are in its zircons, and can use these amounts to figure out how long ago the rock first formed. Counting uranium and lead atoms in a zircon is not something that can be done on the JOIDES Resolution. The scientists will be doing that back in their labs on land. First they find a bunch of zircons within a rock. Zircons are pretty small (less than 1 millimeter) so if you ever play I Spy, don’t say “I spy a zircon” unless everyone playing has pretty strong hand lenses. They want multiple zircons because by comparing a lot of zircons, they can be sure there is nothing weird in one zircon that will give the wrong age for the rock. Once the zircons are found and removed, each one is heated at such a high temperature that all the elements within the zircon are separated from each other, including the uranium and lead isotopes. Each zircon’s elements are then run through an instrument called a mass spectrometer, which allows the scientists to identify and count all the atoms in the zircons. The scientists will mainly just count the uranium-238 and lead-206 isotopes to age the rocks (there are other radioactive isotopes that can be used to age rocks, but these are the main ones they will use on this expedition).